Remember the the Fading Charms ? And remember my start with the sample pieces (approximately 1 1/2 inches approximately square)? The samples lasted through one side of the next-to-last pieced border. I had to cut about 120 more. When digging in my scraps I found MORE sample pieces, these were rectangles, but 1 1/2 wide, so I trimmed them. They were from the late 70s early 80s — I know because I remembered the store name and when I was shopping and ordering samples. The price was listed with each stapled batch and ranged from $3.00 -$3.60. Before you drool too much over the prices, just know it was a hard decision then, whether to spend that extra $0.60 for that special fabric, and my salary for teaching a year would have been somewhere around $6000.00 – $9000.00/year, depending on where. Comparing the old and new samples showed how fabric design has changed. Most of the old ones were floral or polka dots. Many were two colors, then offered in pairs of light on dark and dark on light, then the same design in three or more other colors, again light and dark pairs. Pin dots and stripes were our blenders. Finally I was ready to cut for the last pieced border and got out my June Taylor ruler. It speeds cutting by allowing multiple cuts without lifting the ruler, then one lift to place it perpendicular to the previous cuts. Voila, multiple pieces. Of course you do have to remember the multiples of whatever size you are cutting. I do so much with varied blocks for sampler quilts that I don’t get to use it very often, but I certainly appreciate it when I do. I decided on lime green, and really liked it until the last couple of borders. Lime green may be “the new neutral,” but it is not so versatile as the “old” neutrals. I still like it, but a few notches down in intensity. And the next time I make one, it will be with larger pieces. The quilt turned out great. I enjoyed reading about your use of old, economical (by today’s standards) fabrics. It should impress a lot of people at your show and tell session. 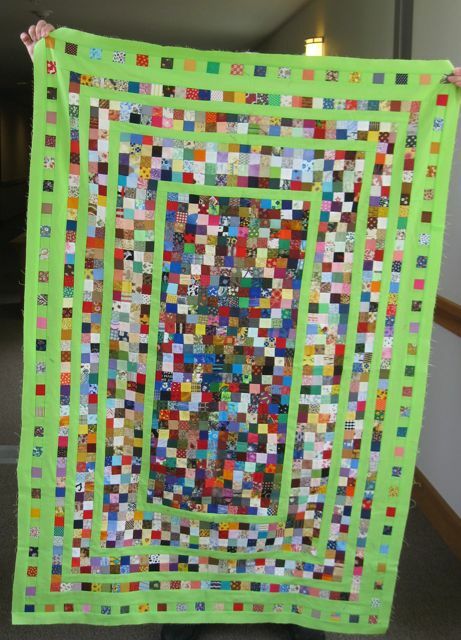 Amazing quilt, and with arranging all those pieces into specific color shades. Wonderful! I love it!!! Your patience in arranging the fade has paid off! 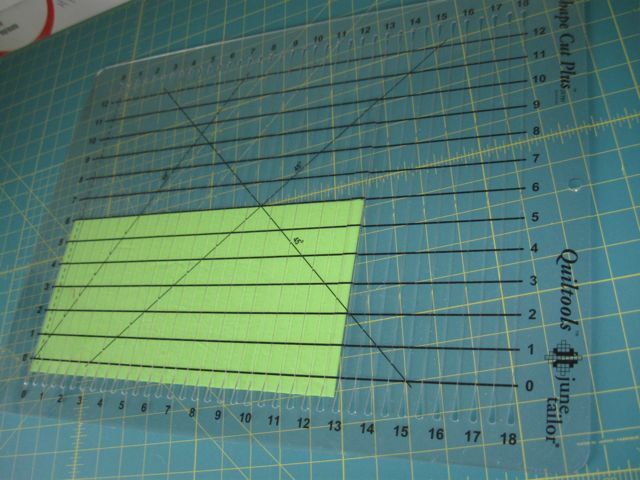 I love my June Taylor ruler too… although the ruler brought to my attention that I’ve been cutting fabric backwards for 20 years! So I just crossed off the numbers and rewrote them from right to left! I can’t believe you’re sending that quilt away. Those small 1.5 inch squares take forever to sew, but it is a beautiful quilt–and I love the lime green. It does however change the quilt a bit. I’ve a smaller postage stamp quilt at the quilter now. It’s a large size wall hanging. I gave up, didn’t go any bigger, but already my 1.5 inch pieces are starting to pile up, but like you I found that what seems like a lot sews into a much smaller piece. I do think this quilt will make someone very happy indeed! I guess for me the fun is in the doing. So long as I have a photo, I don’t mind sending them away. Thanks for the visit. My push to finish was company coming; I knew that out of sight would be out of mind and it would sit! Thanks for dropping by. Man, I love lime green and I love that quilt. I am incredibly impressed. Thanks for the compliments and for dropping by. Great Scrap quilt. I’m certain I have more than enough precut pieces to take that one on. Thanks for sharing. Wow those are tiny pieces! But what a great way to bust through some scraps. Thanks for sharing at Oh Scrap!